With the help of W. M. Keck Observatory on Maunakea, Hawaii and the University of Hawaii Institute for Astronomy’s ATLAS twin telescopes, the multi-institutional team now has evidence that they likely captured the exact moment a star collapsed to form a compact object, such as a black hole or neutron star. The stellar debris, approaching and swirling around the object’s event horizon, caused the remarkably bright glow. The research, which will be appearing in The Astrophysical Journal, was announced today during a press conference at the 233rd Meeting of the American Astronomical Society in Seattle. This rare event will help astronomers better understand the physics at play within the first moments of the creation of a black hole or neutron star. The Cow was first spotted on June 16 after the ATLAS telescopes on Haleakala and Maunaloa captured a spectacularly bright anomaly 200 million light years away in the Hercules constellation. The object quickly flared up, then vanished almost as quickly. For one, the anomaly was unnaturally bright — 10 to 100 times brighter than a typical supernova. It also flared up and disappeared much faster than other known star explosions, with particles flying at 30,000 kilometers per second (or 10 percent of the speed of light). Within just 16 days, the object had already emitted most of its power. In a universe where some phenomena last for millions and billions of years, two weeks amounts to the blink of an eye. Using Northwestern’s access to Keck Observatory’s twin telescopes, Margutti’s team took a closer look at the object’s makeup with the Low Resolution Imaging Spectrometer (LRIS) on the Keck I telescope as well as the DEep Imaging and Multi-Object Spectrograph (DEIMOS) on Keck II. The team also obtained optical images from the MMT Observatory in Arizona, as well as the Southern Astrophysical Research SOAR Telescope in Chile. When Margutti and her team examined The Cow’s chemical composition, they found clear evidence of hydrogen and helium, which excluded models of compact objects merging — like those that produce gravitational waves. In addition to Chornock, Roth, and Metzger, Margutti’s core team also includes Indrek Vurm, senior research fellow at Tartu Observatory, as well as Northwestern CIERA postdoctoral researchers Giacomo Terreran, Deanne Coppejans, and Kate Alexander. Margutti’s team, on the other hand, used a more comprehensive approach. 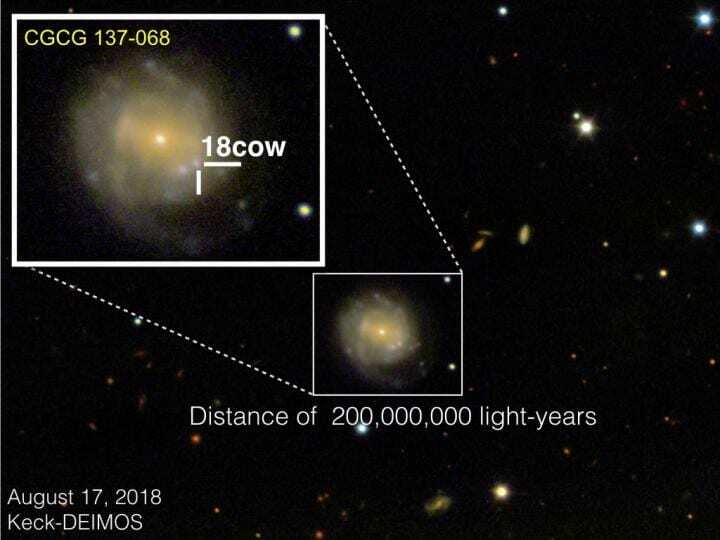 After ATLAS spotted the object, Margutti’s team quickly conducted follow-up observations using multiple observatories to analyze The Cow in different wavelengths. The researchers viewed the object in hard X-rays using NASA’s Nuclear Spectroscopic Telescope Array (NuSTAR) and the European Space Agency’s (ESA) INTErnational Gamma-Ray Astrophysics Laboratory (INTEGRAL), in soft X-rays (which are 10 times more powerful than normal X-rays) using ESA’s X-ray Multi-Mirror Mission (XMM-Newton), and in radio waves using National Radio Astronomy Observatory’s (NRAO) Very Large Array (VLA). This enabled them to continue studying the anomaly long after its initial visible brightness faded. Margutti attributes The Cow’s relative nakedness to potentially unraveling this intergalactic mystery. Although stars might collapse into black holes all the time, the large amount of material around newly born black holes blocks astronomers’ vision. Fortunately, about 10 times less ejecta swirled around The Cow compared to a typical stellar explosion. The lack of material allowed astronomers to peer straight through to the object’s “central engine,” which revealed itself as a probable black hole or neutron star. The Low Resolution Imaging Spectrometer (LRIS) is a very versatile visible-wavelength imaging and spectroscopy instrument commissioned in 1993 and operating at the Cassegrain focus of the Keck I telescope. Since it has been commissioned, it has seen two major upgrades to further enhance its capabilities: addition of a second blue arm optimized for shorter wavelengths of light and the installation of detectors that are much more sensitive at the longest (red) wavelengths. Each arm is optimized for the wavelengths it covers. This large range of wavelength coverage, combined with the instrument’s high sensitivity, allows the study of everything from comets (which have interesting features in the ultraviolet part of the spectrum), to the blue light from star formation, to the red light of very distant objects. LRIS also records the spectra of up to 50 objects simultaneously, especially useful for studies of clusters of galaxies in the most distant reaches, and earliest times, of the universe. LRIS was used in observing distant supernovae by astronomers who received the Nobel Prize in Physics in 2011 for research determining that the universe was speeding up in its expansion. The DEep Imaging and Multi-Object Spectrograph (DEIMOS) boasts the largest field of view (16.7arcmin by 5 arcmin) of any of the Keck Observatory instruments, and the largest number of pixels (64 Mpix). It is used primarily in its multi-object mode, obtaining simultaneous spectra of up to 130 galaxies or stars. Astronomers study fields of distant galaxies with DEIMOS, efficiently probing the most distant corners of the universe with high sensitivity. The W. M. Keck Observatory telescopes are the most scientifically productive on Earth. The two, 10-meter optical/infrared telescopes atop Maunakea on the Island of Hawaii feature a suite of advanced instruments including imagers, multi-object spectrographs, high-resolution spectrographs, integral-field spectrometers, and world-leading laser guide star adaptive optics systems. The data presented herein were obtained at Keck Observatory, which is a private 501(c) 3 non-profit organization operated as a scientific partnership among the California Institute of Technology, the University of California, and the National Aeronautics and Space Administration. The Observatory was made possible by the generous financial support of the W. M. Keck Foundation. The authors recognize and acknowledge the very significant cultural role and reverence that the summit of Maunakea has always had within the Native Hawaiian community. We are most fortunate to have the opportunity to conduct observations from this mountain.